We are a DevOps team and fans of Lean Startup. We believe that testers deserve great testing tools to keep pace with continuous delivery. So we have developed Hiptest, a realtime and collaborative test management platform in the cloud. 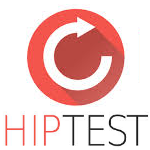 Hiptest is a cloud based, collaborative test management platform that supports behavior driven development and blends in continuous delivery processes. It provides a real-time environment for creating, executing and maintaining tests. It also works with all flavors of Cucumber, the free, open source tool for executable specifications. The highlights of the solution includes its abilities for real-time collaboration, speed and scalability through its unique refactoring capabilities, behavior driven development using Gherkin syntax, test automation through popular test frameworks like RSpec, Jasmine, Selenium etc. and seamless integration with project management and defect tracking tools like JIRA and Trello for both requirements and defects.